With all this talk of cryptomining this year (bitcoin and ethereum have both soared to record-highs), I figure it is high time to discuss the future of outer space mining as well. Once considered more science fiction than reality, the asteroid mining field have started to take its first steps out of infancy. With several privately-funded companies, such as Deep Space Industries and Planetary Resources, already firmly established in the field, asteroid mining will undoubtedly become a crowded sector in the near future. 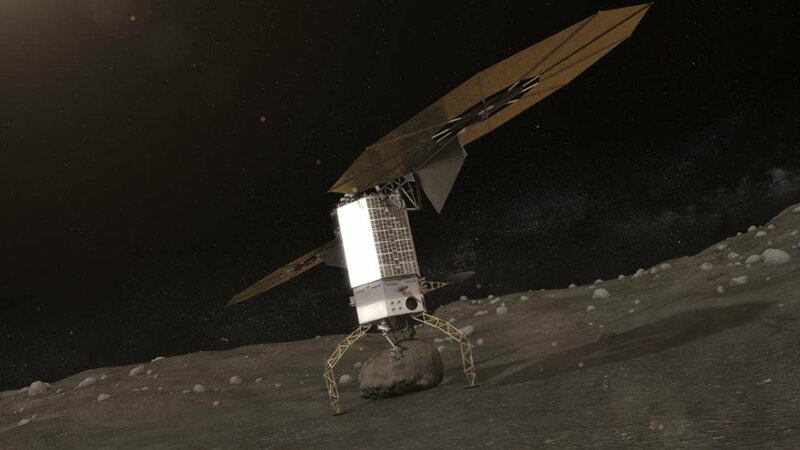 In fact, Deep Space Industries is already planning to launch its precursor mission, Prospector-X, to low Earth orbit later on this year, laying the groundwork (or should I say spacework) for its inaugural space mining mission before the end of this decade. In many ways, the emergence of asteroid mining as a field is of a necessity for the success of future space exploration missions. First, resources on earth is not unlimited; while an active debate rages on when key elements involved in space-related technology, such as palladium, platinum, and etc. might dry up, earth’s availability of these elements is not going up. Second, escaping earth’s gravity itself takes a lot of energy and resources (i.e. it takes about $10,000 to launch a can of Coke into space). If we can manage to make asteroid mining both a cost-efficient and safe reality, the field could laid the foundation for the development of outer-space refineries and manufacturing plants; with these facilities, humanity would be able to mine and refine the materials for, and construct spacecrafts outside of Earth’s gravity, enabling us to plan space explorations of far longer duration at a fraction of the cost of launching that same mission from earth. But, before asteroid mining can truly jet off of its infancy, the legal framework surrounding this field will need further refinement. The current legal state of asteroid mining leaves too much uncertainty for the field to fully flourish, below is what I have uncovered. As with many laws dealing with outer space, the starting point for the legality of asteroid mining is also the 1967 Outer Space Treaty. In Article II, the Outer Space Treaty states that “outer space, including the Moon and other celestial bodies, is not subject to national appropriation by claim of sovereignty, by means of use or occupation, or by any other means.” Since an asteroid is a type of “celestial body,” then through a strict textual reading of the Outer Space Treaty, no country or company could lay any ownership claim to any asteroid. And without the mining rights that come with ownership, then technically speaking, no company or country would be able to asteroid-mine since these entities do not have the ownership rights to the elements extracted . By using the word “use,” some, including asteroid mining companies, have argued that while the Outer Space Treaty does not allow any entity to own an asteroid, it specifically enables asteroid mining as a type of use “licensing” right that would be available to any entity. This would necessarily mean that any entity, while not owning the celestial body itself, would be able to control and own the minerals/elements that such entity extracts from such celestial body. The earth-based analogy would be fishing in international waters: while no country owns any part of such ocean, all countries would have quasi-ownership rights in such waters, including the ability to fish, navigate, lay cables, and perform research activities. Hence, we have a situation that is very similar to the Outer Space Treaty: while nobody can claim any ownership rights to the moon, every nation does have use rights to the moon. So, while the Moon Treaty appears to be just as ambiguous as the Outer Space Treaty in dealing with the topic of asteroid mining, the Apollo moon missions create real life legal precedent in how this language could be interpreted. According to NASA’s Lunar Sample Allocation Guidebook, the Apollo missions “returned to Earth a total of 382 kilograms (842 pounds) of geologic samples.” While not done for commercial reasons, these geologic samples could be considered a primitive form of mining. And even if the United States, via NASA, does not have ownership rights to the Moon, it certainly appears that the United States have total ownership rights and control to these samples. For instance, the same Allocation Guidebook states that “NASA policies define lunar samples as a limited national resource and future heritage, and require that samples be released only for approved applications in research, education, and public display.” Additionally, NASA had already exchanged some of these samples with the then-USSR Academy of Sciences. With these open and notorious as well as perverse “use” activities, it is hard to argue that the United States does not have ownership rights to these samples. Therefore, based on these moon samples, one could argue that asteroid mining would be perfectly legal since an entity is only asserting control/ownership of the resources it mines. However, while the Apollo Moon missions serve as a useful precedent for asteroid mining, it also does not tell the full story. First, the United States, along with many other space-faring nations, is not a signatory to the Moon Treaty, so it is unclear whether the Moon Treaty has any practical effect. Second, the Apollo missions only “mined” a very small and insignificant portion of the moon. Today’s asteroid mining companies are not looking to stop at mere samples; they are looking to extract as much resources as possible. Hence, it is still an open legal issue to determine at what point does the amount of resources extracted would cause that space-miner to be deemed the "owner" of the asteroid, thereby violating the Outer Space Treaty. While the international laws surrounding asteroid mining remains murky, some countries have pressed ahead and established new legal policies and regulations that have been viewed positively by the asteroid mining community. The two countries at this frontier are the United States and Luxembourg. Not to be outdone, in 2017, Luxembourg’s Parliament also adopted a legal framework surrounding the exploration and use of space resources. While never having sent a human or a spacecraft into outer space, Luxembourg is fully embracing outer space mining in its quest to become the world’s capital of asteroid mining. Effective as of August 1, 2017, this law powerfully pronounces in its very first article that “Space resources are capable of being appropriated.” The law then lays out in detail the procedures that are needed to receive an asteroid mining license from the Luxembourg government. Unlike the SPACE Act, asteroid mining was not an after-thought in the text of the Act and this law is applicable to both citizens and non-citizens of Luxembourg. By becoming the first nation to establish such a comprehensive regime related to space mining, Luxembourg is hoping that it will not only jolt the industry forward but also become the preferred state of incorporation for many asteroid mining companies in the future. Speaking of the future, once considered a realm of science fiction, asteroid mining is slowly becoming a bona fide reality. Following the lead of United States and Luxembourg, more and more countries are likely to pass their own outer space mining laws to ensure that they do not fall behind in this lucrative market (resources on some asteroids are calculated to be worth up to 100 trillion dollars). As the field matures, the foundational international treaties surrounding asteroid mining will undoubtedly need to be updated. But, each nation should take heart in knowing that outer space is much bigger than any ocean on earth, and there are plenty of element-rich asteroids for every nation to explore and mine.